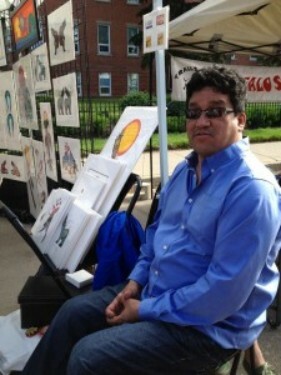 Lloyd Dubois, a member of the Pasqua First Nation in Saskatchewan was born in 1964 in St Boniface Manitoba. His father is Cree, his mother Plains Ojibway. 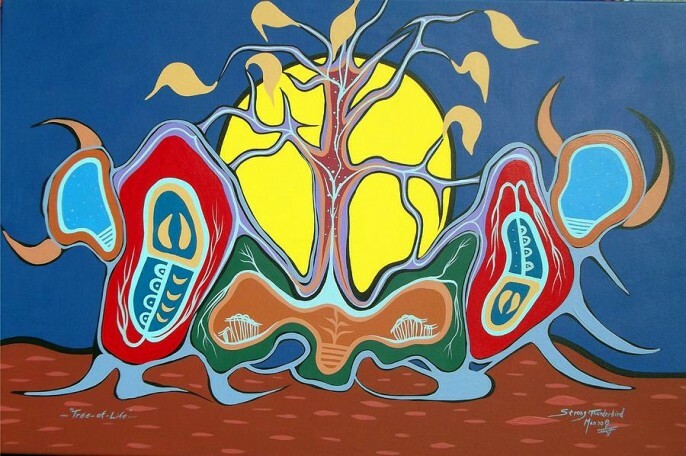 His imagery is heavily influenced by the works of the legend painters who followed in Norval Morrisseau's footsteps. Unlike the woodland artists who live in the forests among rocks, lakes and rivers, Dubois's work often incorporates stylized buffalo which, of course, at one time were central to the Plains Ojibwa lifestyle. He's taken several courses in drawing and painting and his much of his work is done with acrylics either on paper of canvas in the woodland style. He says, "The subjects that inform my visual eye appear to me as animal forms, plant forms, and other not-so-recognized entities from both waking and sleeping dreams. I like to work with acrylic paint because I like its permanence and the unforgiving effect/affect the paint has on my subjects." Lloyd also makes and decorates powwow drums, hand drums and dreamcatchers. He's a juried member of the Saskatchewan Craft Council with works in the permanent collection of the Saskatchewan Arts Board and in private and corporate collections in Canada and overseas. Lloyd Dubois has a BA in English from the University of Regina in 2000 and MA in 2005. He teaches English at the First Nations University in Regina.